Users can also plot multiple functions by separating them with commas. The new feature is available in most browsers and “covers an extensive range of single variable functions including trigonometric, exponential, logarithmic and their compositions,” writes Google engineer Adi Avidor. “I hope students and math lovers around the world find this experience as magical as I found the graphing calculator so long ago,” Avidor says. Google’ search bar has actually long been friendly to the mathematically inclined — or challenged. The calculator feature, which has existed for several years, allows users to type in mathematical equations — ranging from the simple to the complex — for real-time answers. 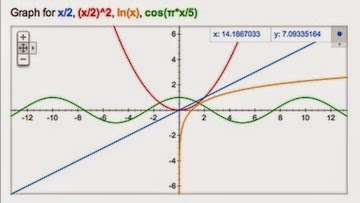 What do you think of Google’s new graphing feature? What should Google add next? What’s your favorite little-known search feature? Let us know in the comments.